In his book,“The Whole Brain Child,” Dan Siegel refers to the thinking brain as the “upstairs brain” and the emotional and instinctive brains as the “downstairs brain.” These names refer to the fact that the newer thinking brain is located above the older (emotional and instinctive) brain structures. The upstairs brain has the ability to plan for the future, taking into account the lessons of the past. For this reason, it’s the upstairs brain that can provide guidance for the downstairs brain’s activities. But to do its job well, the upstairs brain needs to be fully attentive to the physical and emotional information which the downstairs brain sends up to it. And for their relationship to be balanced, the downstairs brain must also be receptive to the guidance it receives from above. When the upstairs and downstairs brains are well-integrated, we have a rich, full emotional life, and a healthy, energetic body. We’re able to make full use of our upper brain’s capacity for rational and creative thought, without getting taken over by our fears, desires, or instinctual urges. 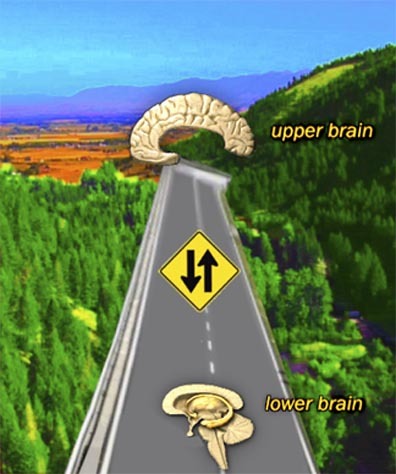 When the upstairs and downstairs brain are well-integrated, their relationship is like a two-way street. 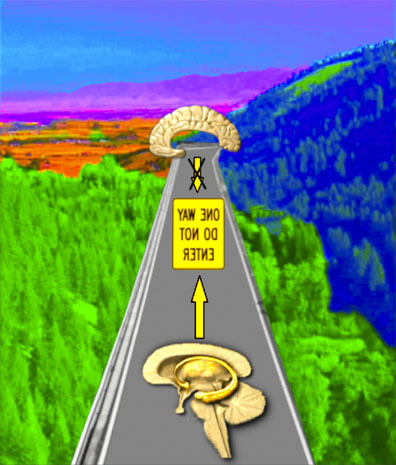 Information can travel freely in both directions, and each brain takes into account what the other has to say. If our upstairs brain dominates the downstairs brain, we tend to live “in our heads,” in a kind of emotional desert, out of touch with our emotional nature, and out of touch with our bodies. When the upstairs brain dominates, their relationship is more like a one-way street. The upstairs brain easily sends messages to the downstairs brain, but messages from the downstairs brain have a hard time getting through to the upstairs brain. As a result, we may be very rational, but our emotional and sensual lives may be somewhat pale, lacking in color and intensity. On the other hand, if the downstairs brain dominates, we can be driven by our emotional reactions, or by impulsive cravings and addictions of various kinds. When either brain dominates the other, our health and our relationships generally suffer. 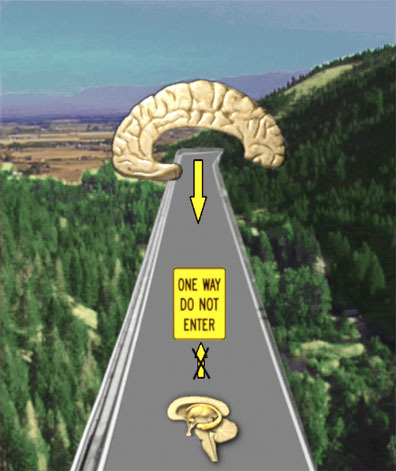 When the downstairs brain dominates, the relationship is like a one-way street from the downstairs brain to the upstairs brain. Messages from the upstairs brain have trouble getting through to the downstairs brain. As a result, our emotions and sensations become vivid and intense, but they tend to be irrational and out-of-control. Did you know that your downstairs brain has a natural hunger mechanism which, when it’s working well, can signal you to eat the number of calories you need in order to match your energy output? Through the release of particular hormones and proteins, your downstairs brain can not only regulate your hunger to let you know when and how much to eat, it can also guide your taste buds to the foods that will provide just the right nutrients for your particular nutritional needs. No nutritionist in the world could possibly do a better job than your own brain of telling you what to eat at any given time. If this natural mechanism were working as it should, your weight would never vary more than 5% above or below what’s normal for your size. So, for example, if your ideal weight is 120 pounds, you’d never weigh more than 126 pounds or less than 114. But most of us have lost touch with our inner nutritionist. For example, when your thinking (upstairs) brain is bent on following the latest fad diet, you may ignore the SOS signals from your downstairs brain telling you your body needs some other kind of food. When your downstairs and upstairs brain are playing their rightful roles and working together in harmony, each brain is mindful and respectful of the cues sent to it by the other. You’ll know when you’re hungry, you’ll be drawn to foods that nourish you, and you can enjoy what you eat. 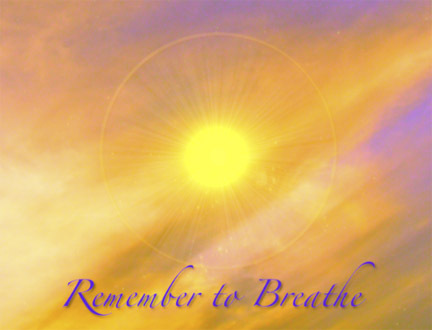 When you remember to breathe, your MPFC can more easily bring your upstairs and downstairs brain into harmony. You can then benefit from the special wisdom each has to offer. And you feel as though you're living from a core of calm, ease, and contentment. Integration of the upstairs and downstairs brains has many other beneficial effects, which you will encounter as you go through the other pages of this site.